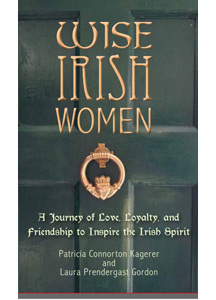 Wise Irish Women: A Journey of Love, Loyalty, and Friendship to Inspire the Irish Spirit brings together the voices of thirty-six women and their stories covering everything from Irish charm, Irish luck, and Irish love of family, to Irish gumption. “I witnessed the strength and character of the Irish from an early age,” says Patricia Connorton Kagerer, who co-authored the book with her cousin Laura Prendergast Gordon. of the world. Buy the Book! The Vice President of Safety and Process Management at CF Jordan Construction in Dallas, Texas, Kagerer attributes her success in a male-dominated industry to the wisdom she learned from her Irish mother and grandmother. Co-author Gordon, who is a Deputy City Attorney for the City of El Paso, couldn’t agree more: “Our grandmother was a huge source of strength and inspiration for both of us. Patricia and I knew this particular rand of wisdom needed to be shared, along with words of wisdom from other women with deep ties to Ireland.” Whether it’s a story by acclaimed author Mary Higgins Clark, playwright Marianne McDonald, QVC Host Jane Treacy, or the authors themselves, each story is designed to inspire women to make a difference in their own corner of the world. Tricia has a master’s degree in education and human development: conflict resolution from Southern Methodist University. She holds a business and public relations degree from Regis University in Denver, Colorado. Tricia is married to Markus and they have two children: Tommy and Anneliese. They currently reside in Plano, Texas. Laura Prendergast Gordon Laura Prendergast Gordon is presently serving as one of two deputy city attorneys for the City of El Paso. Born and raised in El Paso, Texas, she graduated from Bryn Mawr College in Bryn Mawr, Pennsylvania, and then received her JD degree from Texas Tech University in Lubbock, Texas. After graduating from law school, she returned to El Paso and has spent the bulk of her career as a public servant working for the City of El Paso in the office of the city attorney. Laura Prendergast Gordon is presently serving as one of two deputy city attorneys for the City of El Paso. Born and raised in El Paso, Texas, she graduated from Bryn Mawr College in Bryn Mawr, Pennsylvania, and then received her JD degree from Texas Tech University in Lubbock, Texas. After graduating from law school, she returned to El Paso and has spent the bulk of her career as a public servant working for the City of El Paso in the office of the city attorney. Wise Irish Women project was a way of paying tribute to the women in her life who inspired her to strive for success and happiness. Laura is married to Patrick R. Gordon and has two children, a son, Patrick Thomas, and a daughter, Aidan.